Balancing work, family and life is challenging – throwing in a full-time, or even part-time, education on top can seem near impossible. One thing that can ease the struggle of pursuing a degree as a working adult? Employer tuition support. Employers that provide tuition support are making a long-term investment in their employees, and employees take that investment to heart. I learned that recently when speaking with several people for the March/April edition of BizVoice® about their experiences with tuition support and the benefits of attaining those advanced degrees through WGU Indiana. All of those interviewed couldn’t speak more highly of the impact of knowing their employer is actively supporting them. The return on investment for those companies yields people that are devoted to the organization, on top of the more tangible benefits of skilled and educated employees. 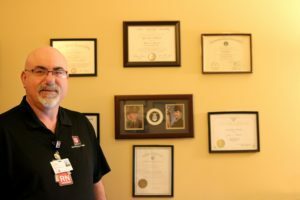 One of the WGU Indiana graduates featured in the story is Dan Minnick, a nursing professional development educator at IU Health Ball Memorial Hospital in Muncie. I asked representatives from IU Health to provide more information on their tuition support program. BV: What is the benefit to IU Health as an employer when its team members have finished their degrees or have completed advanced degrees? BV: What would you say to employers who aren’t currently supporting team members with tuition support? How has this been beneficial for your organization? BV: What do you tell your team members who aren’t sure if they want to go back to school?